Blog Arise Magazine Fashion Week Lagos 2011 Schedule: Deola Sagoe, Tiffany Amber, Jewel by Lisa and More! 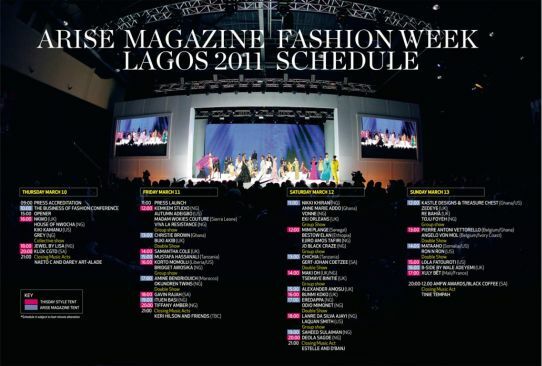 Arise Magazine Fashion Week Lagos 2011 Schedule: Deola Sagoe, Tiffany Amber, Jewel by Lisa and More! Nigeria’s fashion industry gets a major facelift with Arise Magazine Fashion Week Lagos. The event takes place in Lagos from Thursday March 10th to Sunday March 13th 2011. Over twenty Nigerian designers will be showing including the big names like Deola Sagoe, Jewel by Lisa and Tiffany Amber. Nigerian artists Darey Art Alade and Naeto C are some of the performers that will also be performing throughout the week.